ASME B16.9 ss316 lap joint stub ends. *Gasket face finish shall be in accordance with ASME B16.5 for raised face flanges. *The lap thickness, T, shall not be less than nominal pipe wall thickness. 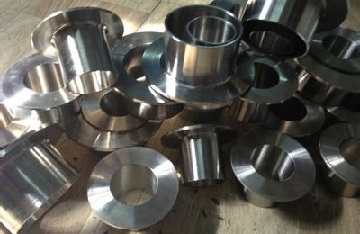 *When short pattern stub ends are used with larger flanges in Classes 300 and 600, with most sizes in Classes 900 and higher, and when long pattern stub ends are used with larger flanges in Classes 1500 and 2500, it may be necessary to increase the length of the stub ends in order to avoid covering the weld with the flange. 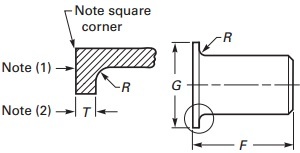 *When special facings such as tongue and groove, male and female, etc., are employed, additional lap thickness must be provided and such additional thickness shall be in addition to (not included in) the basic length, F.
*Dimensions of “Radius of Fillet, R” conform to the radius established for lap joint flanges in ASME B16.5. *Dimensions of “Diameter of Lap, G” conform to standard machined facings shown in ASME B16.5.